They are made by an enterprising confectionary in Tokyo, I hear. I also hear on Twitter that someone's friend whose grandfather is enshrined at Yasukuni was saddened and angered by the frivolous wrappings. Upper left: Nihon wo tori modosu (Take back Japan) sweet buns, from Japan the land of the rising sun. "Tori" in Japanese is phonetically the same as the word for "bird". The sweet bun is made into a shape of a bird, the wrapping says. Cartoon Abe says, "To a new Japan." 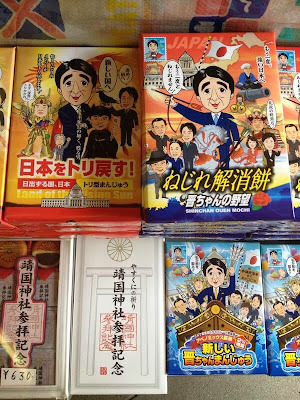 Upper right: Nejire kaisho (No more split Diet) mochi, strong Japan one more time. Cartoon Abe says, "We will never allow split again." 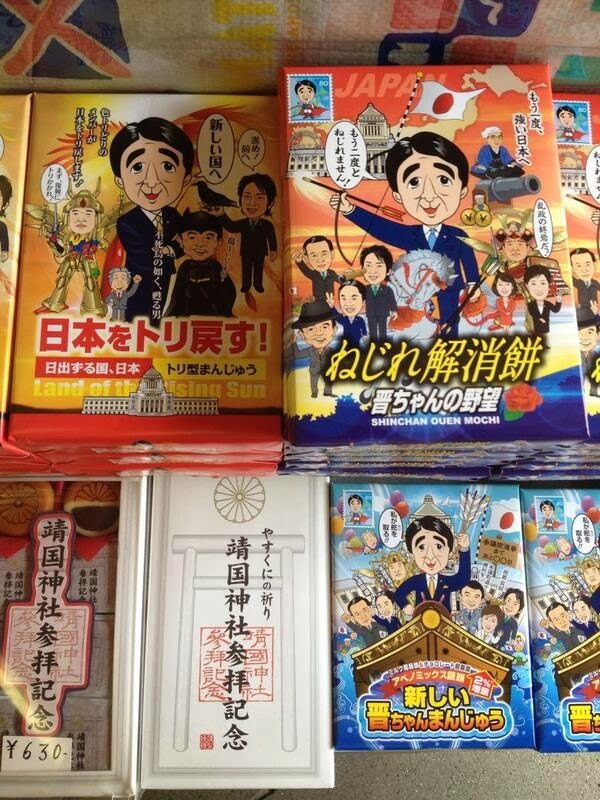 Lower right: Atarashii Shin-chan (New Shinzo Abe) sweet buns, or Abenomics sweet buns, 2% volume up. Cartoon Abe says, "I will be at the helm." Traditional goods to commemorate the visit to the shrine are in the lower left. I wonder how brisk the sales are. Part of the year-end cartoon caricatures done in Japan. In bad taste, to say the least. But as long as everyone smiles, all will be ok.
anon at 7:40AM, these are actually sold at the shrine. Sort of looks like collectible trading cards for one of those kids' games. Not sure which one is more sophisticated, though. Maybe they should change the wrappings. This really is one of the best web sites I’ve ever come across on this subject. This ain't that bad. How much will it cost anyway? At last, I've been looking for this for so long. They say its good! They say it's really good. I want one. Wow! I want that book. Nice post. I like the book. You should try this bun its really delicious! like I'm craving for it right now! i want that book also. I've seen this book before when i was little. And wow! It's still popular today! How much would a sweet bun cost? Where is Yasukuni Shrine located. Would love to try it out soon.